Saturday, May 11th, 2o19 at the Italian Community Center. For an elegant evening that will make a difference and change lives at our 4th Annual Fired-up Fundraiser & Charity Ball, presented by Property Loss Specialist. Tickets will sell out fast as we have sold out the past two years. Be sure to secure your ticket(s) and sponsorship’s right away! Contact Program Coordinator, Eric Salzwedel with any questions on sponsorships. All sponsors will be recognized on social media, on print material, and on promotional material to commensurate with sponsorship level. Please contact us to discuss custom sponsorship packages. When you get your tickets be sure to get your raffle ticket(s) for the Wine Pull and the Restaurant Raffle right away! Only $20/ticket! Wine Pull – Guarantee to take home a bottle of wine! You may even get yourself a $50 or $100+ bottle! Restaurant Raffle – One winner will be selected to win over $500 in Restaurant Gift Cards! Donated items for raffle/auctions are also much appreciated. The dress code is cocktail formal. Want to sit by others you know that are coming? Please indicate their name(s) when you purchase your tickets under “Group Name”. We have partnered with the Hyatt Regency Milwaukee. They have offered a discount on their normal room rate for those booking under “Fired Up Fundraiser and Charity Ball”. There is a room block for Friday May 10th and Saturday May 11th. There will be a complimentary shuttle to and from the Hyatt to the Italian Community Center on May 11th. Details on shuttle will be shared with those staying at the Hotel. Click the link below that goes directly to our group booking. 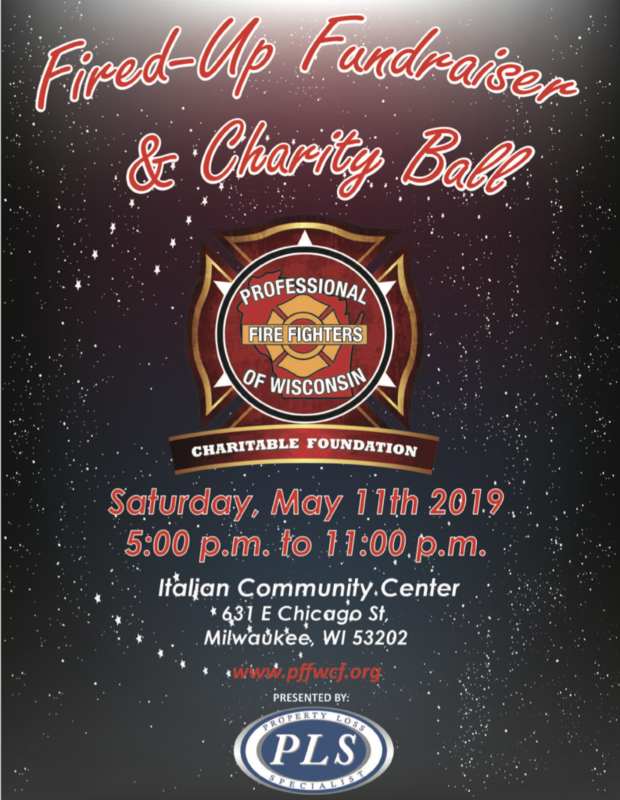 The Professional Fire Fighters of Wisconsin Charitable Foundation is a 501(c)(3) public charity, working to create a fire-safe and burn-free Wisconsin. We prevent fires and burns through education and safety initiatives, and support burn survivors, fire fighters, and communities. Together with our generous supporters and program participants, this event will provide significant and much needed support for our programming. Which includes our upcoming 25th Annual Summer Camp for Burn Injured Youth (or “Burn Camp”), Fire Safety Newspapers in Education program, Fire Safety and Fire Prevention programs and Fire Fighter Support.